Acclaimed music documentary about The Alarm front man and cancer crusader Mike Peters. 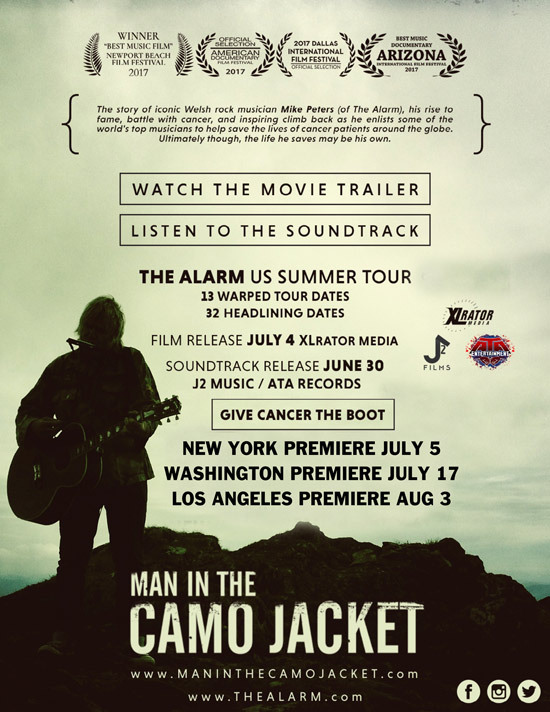 Following its successful US Film festival run, the acclaimed music documentary MAN IN THE CAMO JACKET about The Alarm lead singer / songwriter / guitarist Mike Peters will be released on VOD and iTunes (USA Only), on July 4, 2017 by XLrator Media. The digital soundtrack will be released in the USA on June 30 by The Twenty First Century Recording Company/J2 Records/ATA Records and distributed by Ingrooves. To highlight the film’s release, special events will be held in New York, Washington DC and Los Angeles when Mike Peters and The Alarm are in the USA on tour. In New York City, the film will screen on July 5th at the Williamsburg Cinemas with a performance by The Alarm at the Brooklyn Bowl, NY. In Washington DC, a special screening will be held on July 17th at the Regal Cinemas Gallery Place followed by a Mike Peters performance at the Gibson Showroom. In Los Angeles, California, the Grammy Museum will screen the film on August 3rd followed by an acoustic performance and Q&A with Mike Peters. NB: A European release date will be announced soon but in the meantime, a limited run of the Vinyl Edition of Man In The Camo Jacket is being made available for UK and European fans in all good independent record store across Europe from June 16th 2017. ‘Man In The Camo Jacket’ is being distributed throughout Europe by Ingrooves. 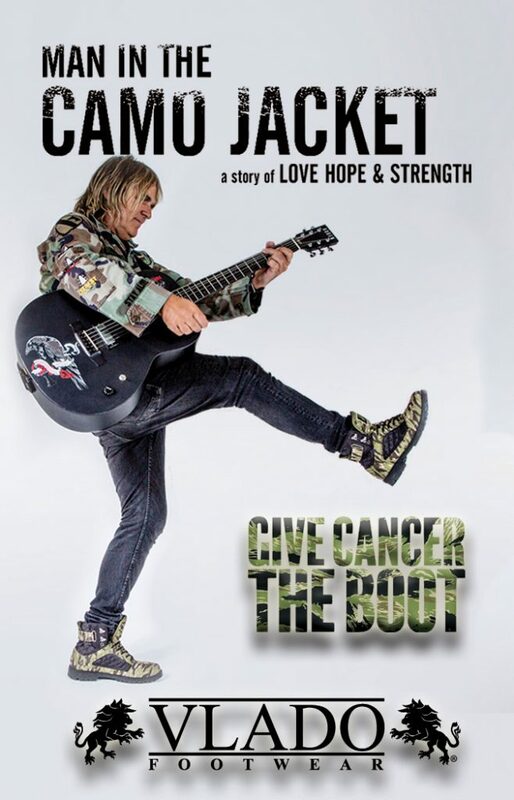 In partnership with the film, Vlado Footwear has launched a “Give Cancer the Boot Campaign” with proceeds from a specially designed camo boot going to support the Love Hope Strength mission. “This remarkable film shows Mike Peters to be not only a brilliant musician, songwriter and performer, but a tireless humanitarian who has dedicated his life to helping other cancer patients and survivors through the charity he co-founded, the Love Hope Strength Foundation. Their work has helped thousands of people around the world. Mike is an inspiration to all of us to make the most of every day. We are so proud to bring this uplifting film to audiences who know Mike’s musical legacy or are discovering him for the first time,” said XLrator Media CEO Barry Gordon. MAN IN THE CAMO JACKET was directed by Russ Kendall at Kaleidoscope Pictures, produced by Jonathan McHugh and Jonathan Platt of J-2 Films (“We Are X”) and James Chippendale of Johnny Lama Productions, and executive produced by Alex Coletti (creator of MTV’s “Unplugged”) and ATA Entertainment. The documentary traces Mike Peters’ rise to fame, battles with cancer, and inspiring climb back as he enlists some of the world’s top musicians to help save the lives of cancer patients around the globe. Filmed over the course of eight years, the film documents Peters’ journeys to the summits of some of the world’s tallest mountains… and to the depths of his regular chemotherapy treatments. MAN IN THE CAMO JACKET features one-of-a-kind performances from Mike Peters and The Alarm along with some of his legendary rock musician friends. The cast includes Slim Jim Phantom of Stray Cats, Billy Duffy of The Cult, Duff McKagan of Guns N’ Roses, Billy Bragg, Glenn Tilbrook of Squeeze, Billy Corgan of Smashing Pumpkins and DJ /VJ’s Richard Blade and Martha Quinn. The Alarm will perform in the USA this summer as a part of this year’s Vans Warped Tour with over 30 coast to coast headline dates from July 7th to August 29th. One of the fastest-growing independent film distribution companies in North America since its creation in 2010, XLrator Media, LLC (XLratorMedia.com) will release 25 films in 2017. Recent releases include Academy Award®-winner John Ridley’s Jimi: All is by My Side starring Andre Benjamin as rock legend Jimi Hendrix, CBGB starring Alan Rickman, and SXSW hits Housebound and The Diabolical. XLrator Media is the home of four acclaimed releasing labels: MACABRE for horror/genre (American Mary, Banshee Chapter), TURBO for action/thrillers (The Machine, Ironclad: Battle For Blood), LIFEFRAME for documentaries (Storm Surfers 3D, Queen Mimi, It’s So Easy and Other Lies) and PACE for multicultural films (Five Star, Allegiance, We The Party).